As agriculturalists re-enter corn fields to scout corn rootworm beetle populations and begin to estimate yield potential, they often find some unwelcome aphid visitors. Heavy infestations on ears and adjacent leaves can grab your attention and trigger the “Should I spray question?” The crop protection urge may be strong with the corn crop we have this year; let’s review what’s known about aphids in corn before you make that spray or don’t spray decision. Figure 1. 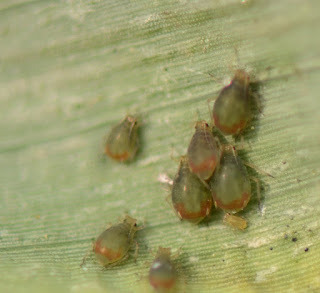 Bird-cherry oat aphids on a corn leaf. Note the dark color and red coloration around the cornicles. Aphids on corn are the same ones that colonize cereal crops and other grasses. Small, dark-olive bird-cherry oat aphids are usually found lower in the canopy, particularly when populations first establish on corn. These move upward on the plant as populations increase. They are the most abundant species in corn this year. Figure 2. English grain aphids. Note the long black cornicles (tail pipes). The black aphid on the upper left has been parasitized by a wasp. English grain aphids are found higher in the canopy. 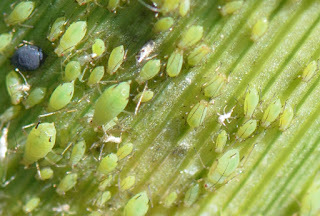 Sometimes, colonies of these larger, light-green aphids with long black cornicles are mixed with those of bird-cherry oat aphids and this is common in corn this year. Some years, the blue-green corn leaf aphid can also be found in the upper part of the canopy, but this species seems less common in SW Minnesota than it once was. Even more rarely we may see some greenbug colonies on corn. Why are infestations worse in some years or fields? The aphids building up in corn don’t overwinter here; they migrate in each spring, colonizing cereals and cool season grasses primarily, but to a lesser extent corn. Later season infestations also may be initiated or supplemented by mass migration from maturing small grains and cool season grasses. Bird-cherry oat and English grain aphids are often more abundant where corn is moisture stressed; other factors, such as soil types, stalk / root rots or even corn rootworm injury, may accentuate stress under otherwise suitable rainfall levels. These stresses can improve quality of plant sap from an aphids perspective. Those of you who look at hybrid comparisons or walk numerous fields have probably noticed that there are differences in hybrid susceptibility with some more heavily infested than others. The increasing use of pesticides in corn may indirectly contribute to aphid buildup. Sometimes, we see more aphids where fungicides or insecticides were previously applied. Fungicides can prevent infection of insects by beneficial fungi, while insecticides remove beneficial insects, such as predators and parasitic wasps. 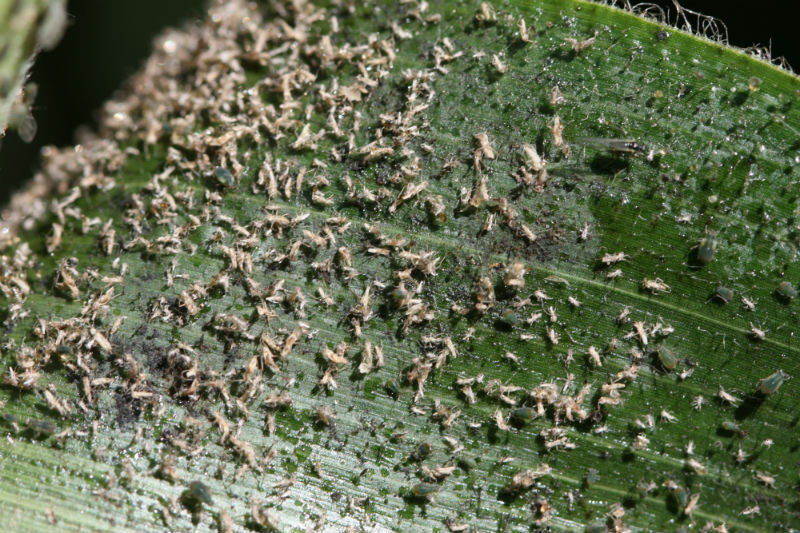 How do aphids injure corn? Figure 3. Corn Aphids have left the plant. Note the cast skins, sooty mold, and remnant aphids with wing pads and winged aphid. Regardless of contributing factors, aphid species can become very abundant, covering plants with aphids and honeydew. Aphids are sucking insects that tap the phloem, the plant plumbing system transporting sugars and other important compounds. Aphids deprive the plant of these building blocks and in sufficient density may affect leaf function, plant growth, and yield. In extreme cases, aphids are associated with dying leaves or rarely, entire plants. Excess water and surplus sugars that aphids can’t use are excreted as honeydew, dropping down to coat lower leaf surfaces. Sooty molds can colonize these sugary leaf surfaces, further reducing leaf photosynthesis. Populations often build rapidly and peak in R3 or milk stage corn. Aphid distribution is changing at this time in response to plant development. Corn aphids are putting themselves in the best position to intercept the higher quality sap moving out of upper leaves and lower stalk into the developing ear. Aphids can, and often do, leave corn as it begins to mature to dough stage. If subsequent rainfall washes off the sooty mold, honeydew, and cast skins, the only evidence of the infestation may be small discolored areas on leaf sheathes and shanks. When are aphid populations worth spraying? Figure 4. Late season aphid infestation on corn. When is it worth treating? Published thresholds for aphids on corn are based on whorl and pre-pollination corn growth stage. Concerns about honeydew on tassels and ears interfering with pollination drove development of early thresholds. Historically, little attention has been paid to the late-milk stage bird-cherry oat and English grain aphid populations we have been finding in Minnesota the past few years. In fact, if you hear a threshold, just realize it's an opinion = not research-based. The question is whose opinion? What is its basis? It is difficult to compare aphids and their damage on corn versus those on soybeans, small grains and other crops. We are not aware of significant virus diseases of corn that would be transmitted by aphids, particularly this late in the season. Corn biomass is much larger than a soybean plant and the amount and water/nutrient content of the two crop's sap are quite different. At this time, corn has already pollinated and pollinated well. The main focus should be on population development in the ear zone and above, since its photosynthesis from these leaves contributed significantly to yield. A crystal ball providing a glimpse into how high population levels will build and how long they persist on the plant would be helpful to spray decisions. Aphids persistence? Aphid populations respond to changes in nutrient quality of corn sap, which reflects moisture stress, stalk rot, corn rootworm feeding, etc. Corn aphid populations post-pollination are incredibly fickle and capable of leaving in mass if they find host conditions becoming unsuitable. The challenge: Would aphids have stayed around long enough that removing them creates an economic return? Other stressors may limit yield response to spray. Very high aphid populations may, in part, be a symptom rather than cause of crop stress. Whether they leave voluntarily or are removed by a spray, the other stressors won’t leave and may limit the plant’s yield response to removal of aphids. Spray coverage and persistence. Sprays depend on coverage for aphid control. With aphids moving from the lower canopy into the ear zone and above, this will increase potential for exposure. Many 2015 corn fields are taller than typical, increasing the coverage challenges. In addition, aphid escapes lower in the canopy can quickly re-infest treated foliage as spray residual declines. If you’re contemplating a spray, make sure there’s adequate water volume for good coverage. Collateral damage. Insecticides can make the situation worse by killing beneficial insects (none to control re-colonizing aphids) or flaring spider mite populations. Potential for moisture stress. This year’s tall plants with high kernel counts are more likely to undergo stress if rainfall gets bit short. If you spray . . .
Good data sets on these late-season infestations are rare but most growers and advisors we have visited with in past years have not seen a yield response for treating corn aphids. However, if you feel an uncontrollable urge to kill some corn aphids or just want to experiment, there are several products that are labeled. Take the opportunity to learn something from this situation. Try leaving replicated check strips. Leave strips wide enough to account for spray drift and leave multiple check strips to account for spatial differences in corn yield potential and aphid populations. Corn has not started to dent. 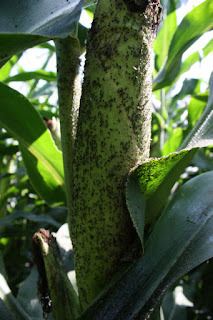 The field is generally infested with a high percentage of plants having aphids. It’s hard to draw conclusions from fields infested only in borders of or pockets within the field. If aphid populations are very heavy above the ear leaf and there is potential for photosynthesis-blocking sooty mold development on honeydew-covered upper leaves. Predators and wasp parasitoids(lady beetles, Syrphid flies, parasitized mummies, and etc.) and signs of fungal disease are not abundant. How's that for a generality? Once established, predators and disease can remove large numbers of aphids without your help and may trigger aphids to move. 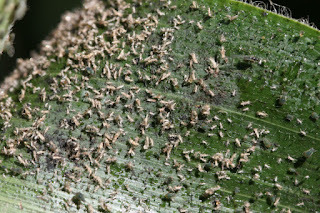 Winged aphids or nymphs with wing pads are not easily found. If present, the population may be ready to leave the field. The plants are not already covered with sooty mold or showing signs of stress. Any yield loss has already happened. There are no guarantees on economic return on late-season aphid sprays in corn. Most often, it’s because heavy infestations are discovered late and the aphids were ready to leave anyhow or damage had occurred. Our inclination is to leave these late season populations alone. Walk away from dented corn where a large portion of yield is already fixed- the aphids usually do.